13-Day or 9-Day Best of Botswana Safari Tour. > 13-Day: Depart from Johannesburg and end in Victoria Falls, Zimbabwe. > 9-Day: Depart from Maun in Botswana, and ends in Victoria Falls, Zimbabwe. > Lodge Accommodated Safari Tours. 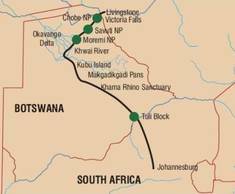 The route covers some of the most spectacular wildlife area of northern South Africa's Tuli Block wildlife region, Botswana's Savuti, Chobe & Moremi Reserves, and finally ending at the majestic Victoria Falls! > Wildlife wilderness of the Tuli Block. > Day and night drives in Moremi's Kwai region. > Big 5 Wildlife galore in Moremi, Chobe and Savuti Reserves. > Sunset cruise on Chobe River. > Botswana's Okavango Delta with optional Delta flight. > Big 5 Wildlife experience in Moremi, Chobe and Savuti Reserves. > Chobe River sunset cruise. Experience the real Africa on this Botswana safari! Departing from Johannesburg, we travel via scenic little towns to South Africa's Tuli Wildlife area. Our wildlife adventure start with game drives to find the Big 5. After the Tuli, we make our way to one of the few white rhino sanctuaries in Botswana at the Khama Rhino Reserve. With our experience with the rare and highly endangered white rhinos done, we travel into the more isolated Kalahari regions of Botswana. Kubu Island with its huge baobab trees in the Makgadikgadi National Park is our next destination. We will explore this scenic wilderness area with game drives, looking for big herds of Springbok, Oryx and various other antelope. Leaving the wide open spaces of the Makgadikgadi behind us, we make our way to the Maun (The shorter 9-day safari version departs from Maun), on the southern point of the Okavango Delta. OPTIONAL: Scenic flight over the Okavango Delta. From Maun, we journey into the Khwai area of the Okavango Delta, where we will go on an excursion in the traditional dug-out Okavango canoes to explore this water-world. Various day and night game drives are planned along the floodplains looking for the big herds of buffalo and elephant. This area is also rich in leopard and lions, who pray on the many antelope species found here. Travelling deeper into the Moremi and later Savuti wildlife areas, for more wildlife experiences, with finally reaching the famed Chobe National Park. At Chobe, we again do a morning game drive to enjoy the Chobe wildlife on land, and later on a sunset boat cruise on the Chobe River. Crossing the Botswana / Zimbabwe border at Kazangula, we make our way to Zimbabwe's Victoria Falls. Here our wildlife adventure will end after the last day's breakfast. - Park entrance fees & Game drives. Tour departs from Maun, Botswana: 2015 – Please note the tours are conducted in a specific language. 24.06.15 - 12 seats available - GUARANTEED DEPARTURE, ENGLISH guided. 13-Days from Johannesburg: 2015 – Please note the tours are conducted in a specific language.